I picked up a Moog MinitMoog synth from the 70's. I am currently restoring it. I would really like to add a CV in and Trigger, so that I can control it from a sequencer. I see a lot of mods to add CV out, but not so much for CV in. Can anyone point me in the right direction? I've attached the keyboard part of the connection. Can I just connect the incoming CV to the opamp that the keyboard connects to ? And then I am unsure how the gate would be connected. Any ideas / help would be appreciated. The following links explain how to connect a midijack(midi->cv, gate) to a minimoog. 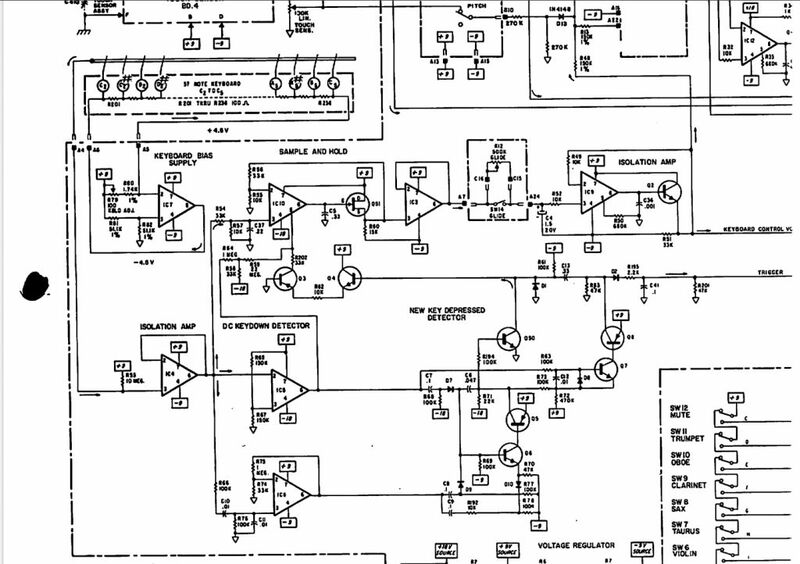 Together with the schematics you should be able to figure out how to achieve what you want. 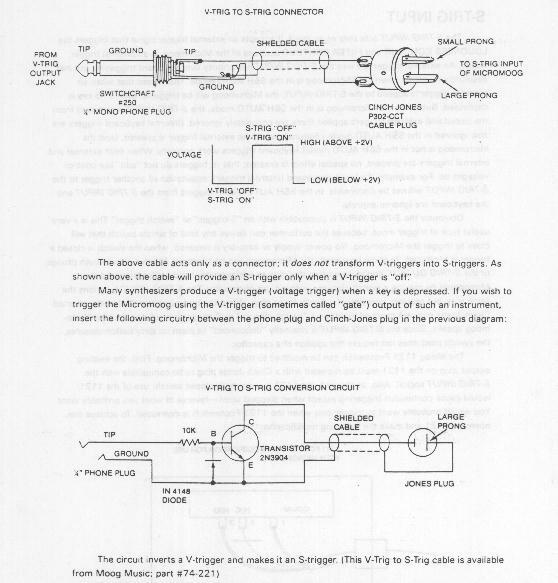 Don't forget the minimoog uses s-trigger, so you will probably have to covert the v-trigger from your sequencer to s-trigger. Can anyone point me in the right direction? I've attached the keyboard part of the connection. Can I just connect the incoming CV to the opamp that the keyboard connects to ? No. The keyboard output goes through R68 (150k 1%) to the summing node of the DC Summer which is above the schematic you showed. You need to add another resistor going in to that node. To work out the value measure the "keyboard control voltage" change going in to R68 when playing two notes an octave apart and scale 150k accordingly. And then I am unsure how the gate would be connected. For a positive gate you need another diode and 2k2 resistor joining the signal called "Trigger" on the right. The following links explain how to connect a midijack(midi->cv, gate) to a minimoog. Not much help when he's got a Minitmoog. Thanks Neuro - Looks like I have some reading to do! Your website and products look amazing! Thanks for helping me out! No Worries Neuro - I appreciate your taking the time to reply! I just wanted to say thanks - I am making progress!